Sailboat Anchors...How do you say Sominex? 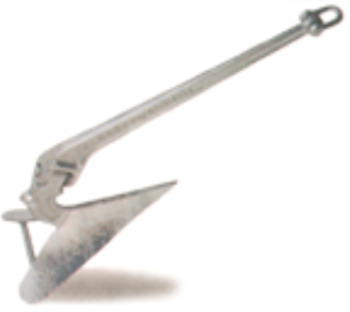 The choice of your sailboat anchors are very important to the sailboat cruising lifestyle. Anchor drill at 2 AM is never pretty. The right anchor will help keep this to a minimum. The skill of setting the hook will also separate you from the new cruisers and bare boaters...it is a ritual you need to learn, and never deviate from, here is how to do it right. My anchor has never come free...I have never done anchor drill at 2AM... I'll make a blanket statement that anyone who tells you the above, is lying, been cruising for 2 weeks or less, or is incredibly lucky. My worst experience of anchor dragging was in Admiralty Bay, Bequia, the bottom close to the dock is very hard sand and makes setting the hook very difficult on a good day. I thought we were all set (this was our first winter cruising)...long story short we were awakened at 6AM by a passing dinghy. We were almost to Moonhole, about half a mile from where we were "anchored", in 96 feet of water...how we did not hit another boat on the way out is a source of amazement to this day. Never had another major incident for 8 years, that was enough. It doesn't have to happen to you. After a few days in any given anchorage, make sure you are up top with a cold beverage about 3PM when the bare boats come in to drop the hook. In Vegas you would pay for this. The attempt to anchor can some times reduce one to tears. It is usually accompanied by lots of yelling, back and forth...This usually repeats about 2 to 3 times, or until you get tired of watching or are worried they will drag into you in the middle of the night. You then go help them out of mercy. When coming into an anchorage review the charts to get an idea where you want to drop the anchor. After the sails have been stowed, the deck clear, make sure you have pulled in and tied off the dinghy painter so it will in no way foul the prop. The first mate has the boat under power going slow as you give hand signals for direction...at the bow you point your finger down...the first mate interprets this as what is the depth and responds with a number... this is the only verbal communication necessary. You make a fist and the first mate goes into reverse to stop the boat, then back to neutral. Look down from the bow to make sure the bottom is sandy...release the anchor from the roller...let out enough chain to give at least a 5 to 1 scope 8 to 1 is even better if you have room to swing. With the engine in neutral let the wind straighten the boat out...lock the anchor chain with a pin in front of the windlass. Watch the chain, when it straightens out check for a vibration on the chain (carefully with your toes)...be patient, it is better to set the hook naturally...after a minute or so if you think it has caught. If all is well the boat should spring forward a bit indicating that the anchor has set. Reach down, put on the snubber hook about a yard down from the anchor roller, tie it off...turn off the engine , return the painter to normal length and have a cold one. No yelling, no stress, no problems. The CQR sailboat anchor, the cruisers choice in the Caribbean. It's the best sailboat anchor you can buy, fits nicely on the anchor roller, and holds great in sand, your usual bottom. Combine that with a good windlass ,the Lewmars were the most popular, 200 feet of chain and you are all set for many a pleasant night's sleep on the hook. Do not even think you can get by with 50 feet of chain and 150 feet of rope. You retire to relax...not to worry about the anchor holding when the wind comes up. You will need a second sailboat anchor on board. We used a 22 lb Delta with 30 feet of chain and 150 feet of rope. This is OK only as a second anchor, it should not be up top, you need to stow it an locker...remember you will most likely set and pick this puppy up from the dinghy it can be tough on the back...In the Windwards and Leewards this is not often necessary...thank goodness. It depends on how well you want to sleep, the heavier the sailboat anchors the better. We had a 35lb for a 17000 lb boat, and did fine. A 45lb would have been even nicer. Make one up from 6 to 10 feet of 3/8 double braid low stretch halyard line , used for main sheets, jib sheets, etc. Attach a chain hook (the right size) with a shackle. Slide a foot long section of clear hose over the chain (anti chafe gear where the snubber goes through the chock). Why use good halyard rigging?...you will be handling it a lot and three strand will chafe your pretty hands. Attach the snubber hook to the chain about 3 feet from the roller, you will really look graceful when you do this, pull it in where it takes all the chain tension off your windlass and the anchor pin (both are insurance), run it thru the chock, put the chafe guard in place, tie it off to a cleat. Be ready to repeat process at 2 AM when the wind dies and the hook falls off...you will learn how to secure that hook on the chain, trust me. The choice of proper sailboat anchors is crucial to your having fun...and that is what you will have sleeping with the knowledge that the boat and you are not going anywhere with the hook dug firmly into the bottom. 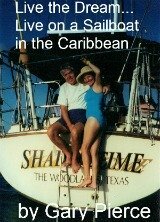 Living aboard a sailboat is a wonderful way to enjoy frugal retirement living but do not skimp on this important piece of gear, sailboat anchors. It's Sominex.